Please contact us for a Return Merchandise Authorization (RMA) number by chatting with us online or by clicking the Support tab located on the bottom left hand side of our website. Once you contact us for the RMA number, we will email you back with the RMA number and the return address to which to return your items. The item(s) must not been used, cut or damaged; must be in new, resalable condition. The item(s) must be returned with original packaging. 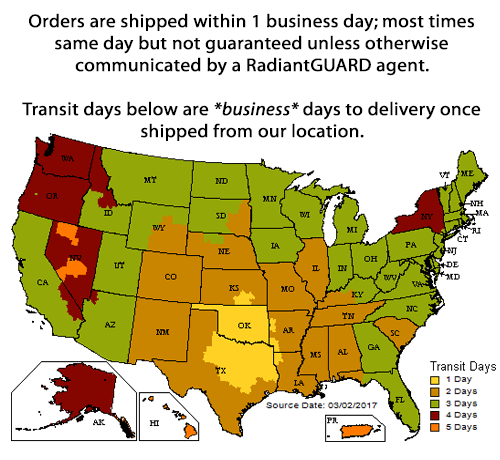 The item(s) must be returned to Radiant GUARD within 30 days of obtaining a Return Authorization (RA) number from Radiant GUARD. The Return Authorization (RA) number must clearly identified on the outside of the package. Please obtain tracking number(s) from your shipper (FedEx and UPS provide one with all shipments; with USPS, you must pay for the Delivery Confirmation service to obtain a tracking number). Once you have your tracking numbers, respond to your support ticket and include both the Return Authorization (RA) number AND the shipping tracking number. Once we receive your return, if the above conditions are met, we will refund the purchasing credit card the purchase price plus appropriate taxes paid. We cannot refund shipping costs unless the return is a result of an error we made shipping you an incorrect product. We currently do not support item exchanges. If you need to exchange an item, please follow the process above for obtaining a refund and place a new order for the replacement item you need.